Uncertain Times? Celebrate ‘What IS’ than Worry about ‘What IF’! 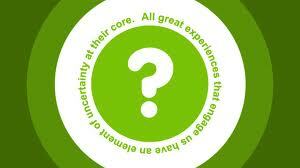 Embrace uncertainty and you will thrive. Fear it and you will suffer. Certainty is a man-made illusion. Before you were born, where was the certainty that you would be? When you were an infant, where was the certainty that you would be provided for, fed on time, cared and loved? As you grew older you were tricked into this illusion of certainty __ you are sure to have a home, you usually have both parents with you, siblings, education is guaranteed, and you are bound to get a job, earn wages and raise a family! How much more simpler Life would be if only it were to progress in this certain, assured, linear fashion__one thing leading to another with such predictability and precision? Just to demolish this illusion, and wake up to reality, if you live in any part of urban India, go to a busy traffic intersection closest to you. And after getting over the shock of seeing so many homeless, destitute children begging there, strike up a conversation with any or some of them. You will soon discover how uncertain their lives have been. And continue to be. Maybe some were abandoned by their parents. Maybe some were kidnapped by organized racketeers in the begging syndicate. They live on and off the streets. Abused by people like us who despise their presence and by heartless cops who extort their meager earnings from them. When you understand their Life’s design, you will awaken to the inscrutable, uncertain ways of Life. And when you think about it, you will just be grateful that you were born to your parents and not to theirs __ and there was no way ever you could have been certain of this realization until this moment! It is also when you are faced with uncertainty for the first time, that you will stop taking Life for granted. A first layoff, a first health crisis, a first relationship break-down, a first financial crisis – that’s really when you begin to realize that perhaps you had read Life differently. That maybe, just maybe, you cannot really be certain about some things in Life. The truth however is that you can be certain about nothing in Life. Because time is uncertain. Each moment is different from the previous one. It is one aspect of Life which is changing continuously. So, when time is changing, when there is no certainty with time, the measure with which you estimate your lifetime, where is the question of anything else being certain? Events keep happening to you over the course of an ever-changing time and each event changes you. People, therefore, too change with time. Much of how you responded to Life is obsolete, the same way as some of the technology you used in the past. As you grow older ideally your ability to deal with uncertainties gets better and better, provided, of course, if you have learned from earlier such episodes. The way to deal with uncertainty is to welcome it. Don’t try to wish it away. Because it ain’t going anywhere. It is always here with you. For instance, if you have a good job, enough savings and investments to take care of your retirement, where’s the certainty that your health will be all fine or that your companion still loves you? Of if you have a health complication and have the best doctors treating you, where’s the certainty that you will still survive? Where is the certainty that your family members will live long enough to be with you till your very end? So, don’t try to imagine Life without uncertainty. If you accept Life as being uncertain, you will find joy in each moment. The second principle for dealing with uncertainty is to know that your worrying about anything, especially about a future that no one has seen, is not going to change the course of your Life. It is a common tendency, with you as well as with other people, to get into a hyperactive mode, working out various what if scenarios in your head, preparing for the best and planning for the worst. In the end, none of your worrying or planning is going to alter what is to come. As Eckhart Tolle says, “Worry pretends to be necessary but serves no useful purpose.” So, when you finally recognize uncertainty__though it has always been there__stress not your mind, instead calm it. Your mind is the villain in such situations. It will fight hard to demand security, to insist on a structure to your Life’s situation. If you succumb to your mind you will become fearful. And your fears will create, will aid and abet, your suffering. So, approach any uncertainty with a ‘WHAT IS’ than with a ‘WHAT IF’. ‘What is’ is a celebration of the moment you are in now and there’s nothing uncertain about that moment. It is happening. So, there can be no fear of it. ‘What if’ is loathsome, fearsome and amplifies what is not yet. It is imaginary and breeds suffering. In the end, it is so very simple: when you embrace uncertainty you will find immense joy and beauty in this totally unpredictable, inscrutable experience called Life! Author AVIS ViswanathanPosted on January 7, 2013 March 14, 2016 Categories Acceptance, Certainty, Change, Fear, http://schemas.google.com/blogger/2008/kind#post, Intelligent Living, Loving what is, Mind, Suffering, Uncertainty, What if, What is1 Comment on Uncertain Times? 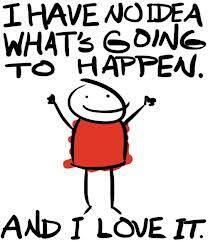 Celebrate ‘What IS’ than Worry about ‘What IF’!